On October 7th, after four years of deliberations, a five-year master plan will be unveiled at a Cleveland City Planning Commission meeting for a project that’s been 28 years in the making. Marked by a canopy of Central and South American flags along the intersection of Clark Avenue and West 25th Street, La Villa Hispana is one of four revitalization initiatives underway in the diverse area. The others include the transformation of the Metrohealth campus, an International Village and changes for the West 25th Street Corridor. 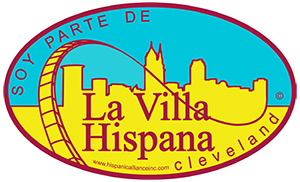 Situated in the largest enclave of Hispanic residents in the state, the mission of La Villa Hispana is to become the economic and cultural center of the Cleveland's Latino community, drawing inspiration from other metropolitan areas that, by paying homage to Latin heritage, have created vibrant hubs such as Miami's Calle Ocho and Paseo Boricua in Chicago. The four-member executive committee for La Villa HIspana includes Jenice Contreras, executive director of the Hispanic Business Center (HBC), Adam Stalder, managing director of Metro West Community Development Organization – which is under the umbrella of the Detroit Shoreway Community Development Corporation (DSCDC), Lourdes Negron-McDaniel, director of inclusion and diversity at the MetroHealth System and Juan Molina Crespo, executive director of the Hispanic Alliance Inc.. The group is working on the overall initiatives from a coordination perspective. The three focus areas for the project include arts and culture, community engagement and economic development, all of which will be fostered through strategic partnerships and by utilizing existing assets in the community. Likened to Asia Plaza and the West Side Market, the vision of El Mercado is a food hall and public market cradled by outdoor space for gathering and events. At its core, the effort will be a community kitchen and will house kiosks wherein artisans, cooks, florists and seamstresses can transform their trades into entrepreneurial endeavors by offering moderately priced goods. According to Contreras, the project aims to tap into local talent that may be operating under the radar or have yet to launch due to a lack of opportunity. “We’re currently a food desert" says Contreras, "and El Mercado will be a pillar project of La Villa Hispana, addressing the community’s need for access to affordable, ethnically-appropriate, fresh foods." The initiative is being led by HBC and its board of directors. HBC will own the building as well as manage the project. The final site for El Mercado has not yet been determined, although the group aims to maintain close proximity to Lincoln West High School and West 25th Street. More than merely a park, La Plaza Central will create a center for socialization and accommodate public parking. 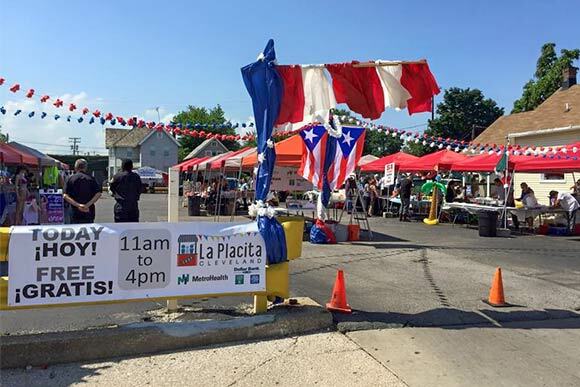 It will also provide a home for the annual La Placita festival. As with neighborhoods and communities around the U.S. and abroad, revitalization and development in Cleveland can be the catalyst for gentrification - a byproduct of growth Contreras is adamant to avoid. “It is important that any redevelopment that happens here starts with the people. How do we include them? What makes a vibrant community? And how do we make sure that those needs are being woven into the fabric of that development?” she poses. La PlacitaAccording to Crespo, growing pains are to be expected when taking an organic approach to community development, but he’s committed to ensuring La Villa Hispana is a project that benefits the whole region while honoring people like his father – a man among the pioneering Puerto Ricans first recruited to Northeast Ohio in the post-WWII era by heavy manufacturing investors in need of able-bodied labor to withstand the rigors and heat of the steel industry. “Authentic community engagement has to be at the center to fully realize the vision of this plan taking into account the values, traditions and norms of the people, meanwhile advocating strongly for authenticity,” Crespo says. To foster this exchange, the executive committee will integrate faith-based representation into community engagement activities by involving neighborhood church leaders, and empower residents from the very start of the project through grassroots outreach, focus groups and town hall meetings. No stranger to the growing pains mentioned by Crespo, Ward 14 councilman Brian Cummins began representing the area in 2010, just four years after being elected to City Council. At first glance, Cummins - a gringo - seems an unlikely advocate to champion La Villa Hispana. The Brooklyn Centre resident, however, is bi-lingual in Spanish. He honed his language skills with a cultural immersion in the Dominican Republic as a Peace Corps volunteer in the early 90s. In the past half dozen years, appointments and subsequent amendments to his jurisdiction have cast a wide net, stretching his umbrella of responsibility across Brooklyn Centre, Clark-Fulton, Stockyard, Tremont and Cudell. As a neighbor and a civic leader who’s been involved in local refugee housing and relocation efforts, his investment in the project’s success is both personal and political. Addressing the need for a physical CDC presence in the neighborhood and capitalizing on the resources of the nearby DSCDC, Stalder and other staffers from the Stockyard CDC (which closed in 2010) joined forces to form the Metro West Community Development Organization. The first phase of that definition will be rolled out in the form of a streetscape that incorporates architectural and artistic elements to clearly convey a sense of space and Hispanic influence when you enter the neighborhood. As was the case in the Flats and Gordon Square, the work to transform La Villa Hispana is a layered, long-term endeavor that won’t happen overnight. Once complete, however, it promises to be a bright spot on Cleveland’s landscape as well as its legacy. 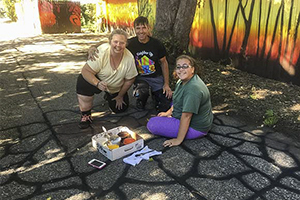 Michael Mishaga joins Rebecca Kempton, left and her niece, Megan, to beautify Newark Ct.
Less than a mile away from where La Villa Hispana plans are percolating, Clark Fulton residents are already enacting the "authentic community engagement" the lofty initiative aims to embody. They're also exemplifying just what this stalwart Cleveland neighborhood is all about. Last weekend, they got together to further transform their own little corner of the city: Newark Court – an alley that spans between West 43rd Street and Fulton Road. 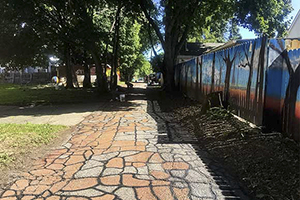 The effort, which began in 2013 and was funded by a Neighborhood Connections grant, concentrates on the stretch between West 38th and 41st Streets. The narrow path is lined with backyards, fences and garage doors. 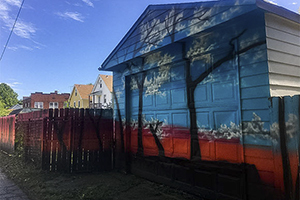 And while many of them are brightly painted with murals of trees, skies and sunset colors - all of which were created and painted by the residents, it wasn't always this way. "This was a scary dangerous, dark place," says neighborhood artist Michael Mishaga, adding that the group removed no less than 17 tons of debris and overgrown foliage from the alley. "This was a dumping place. The neighbors came together to clean this out." Rebecca Kempton, founder of the Fulton West Block Club, is one of the powerhouses behind the effort, which is dubbed, "City Repair @Newark Creek Court." "There was a natural stream that ran under this alley – that was the inspiration," says Kempton, adding that one resident who has been in the neighborhood for 55 years remembers when water used to bubble and pool in the alley. "We started knocking on doors," she recalls of the project's inception. Within days, residents unanimously signed on. 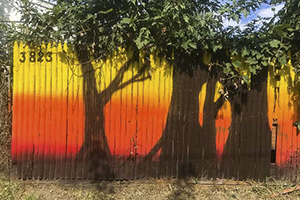 While the colorful murals were no problem, when the group approached the city about painting the street to look like a riverbank, they were denied. Street painting was not legal in Cleveland. 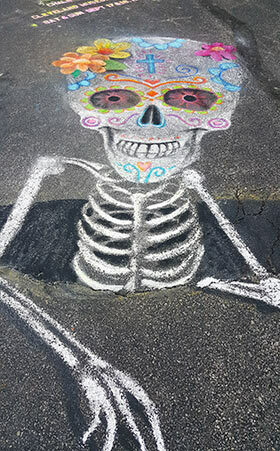 After three years of patience and working with then-councilman Joe Cimperman, they pushed through legislation that allows street painting in certain situations. Hence this weekend, full up with paint, creativity, elbow grease – and a permit, they took to the street to bring the last component of their vision to fruition. The event included a celebratory gathering on Sunday, which embodies perhaps the most important part of the project: community. "It did bring people together. People help where they can," says Kempton, adding that those who didn't paint would offer up plates of home-cooked rice and beans or just conversation. "Even by showing up and hanging out, you're playing a part," says Mishaga. In a city where the thrum of construction never ends and where massive public art projects dazzle, there is no denying that this heartfelt effort has a brought a certain magic to this otherwise hidden nook of the city. "This is where people live," says Kempton. "This is community art at a real level."